Pallet scales make it possible to weigh a variety of different types of loads directly from the loading ramp. With the use of these pallet scales, it becomes possible to save time, shortening the path that has to be taken with full pallets. Using these scales will also allow for reduction in the number of workers that have to be present to work with the pallets. There are generally two different types of pallet scales that can be used, which are pallet scales available for crossing over the loads and pallet scales that are introduced into the path of that load. 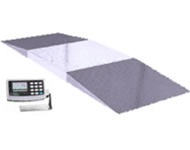 Both of these types of scales require pallet scale calibration in order to precisely fulfill the specified accuracy capabilities. Over time, even the highest quality, precise pallet scales can require calibration because repeated use can prevent the scale from delivering the same precision as it was initially capable of. What this means is that on a regular basis, producing the most precise and accurate results with pallet scales are going to require that the calibration process be completed. The pallet scale calibration process is designed to make sure that the information that is being provided by the scale is completely accurate. Calibration is not a process that can be completed once and forgotten about. The best way to reach perfect accuracy is to complete the calibration process after a set period of time in order to make sure that the scales continue to weigh accurately and with the necessary precision. Scales for home use do not typically demand the same level of accuracy, but in business and industry purposes it becomes vital to produce results that meet specifications every time. There are a number of causes for scales to begin showing weights that are inaccurate. Components of the scale are capable of wearing out through use, and wear and tear, and this can change the reading. Additionally, environmental factors also play a role. As an example, some types of scales do not perform very well in cold weather, and if they are calibrated to work in a warm area and then expected to be used in a cooler environment, the results may change. Higher quality scales will generally specify a wider temperature range. Also, the more that a scale is used, the more likely it is that it will become inaccurate over time, making pallet scales calibration a necessary process over time, even if only as a preventative measure and to make sure that the scale continues displaying accurate readings. With older electo-mechanical scales, scale calibration involves carefully moving screws and levers to adjust how the scale operations. Some digital forms of scales have buttons intended specifically for the calibration process. Using several different known weights is a good way to determine whether or not a scale requires calibration. If the items are weighed and the results are not precisely accurate, then the calibration process should be completed.